A dental implant (also known as fixture) is a surgical component that interfaces with the bone of the jaw or skull to support a dental prosthesis such as a crown, bridge, or denture. the formation of a direct interface between an implant and bone, to give her stability and support), where materials, such as titanium, form an intimate bond to bone. 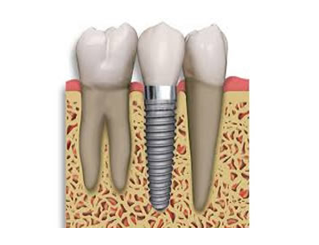 The implant fixture is first placed, so that it is likely to osseointegrate, then a dental prosthetic is added. A variable amount of healing time is required for osseointegration before either the dental prosthetic (a tooth, bridge or denture) is attached to the implant or an abutment is placed which will hold a dental prosthetic. Many years ago Implant was considered as a Miracle way for teeth compensation, but today it became as a routine daily job to well trained dentist. We would like you to have a basic understanding of what implants are, what can be expected from them, and what limitations they might have in your specific area of need. A dental Implant can be used to provide an abutment (anchor or retainer) to replace a single missing tooth, several missing teeth, or provide retention to hold a removable dental appliance such as a full denture. In fact, if you missed all of your natural teeth, with Implants it is possible to have Upper and Lower fixed teeth which they are not coming out and you cannot remove them yourself. 1 – Surgical Stage : In which a small incision is made in the gum area where the implant is to be placed, preparing a place for the implant in the underlying bone, inserting the implant into the prepared site, and then closing the tissue over the implant with several sutures. Healing time may vary according to the density of your bone, as it is short in the lower jaw cause the bone is denser than that of the upper jaw. 2 – Prosthesis Fixation Stage: In which, and after the healing and integration of the implant has happened, the placement site is exposed by reopening the gum. A post will then be fastened to the implant by cement or with internal threads. Impression taken and send it to the lab for crown/ bridge construction. At this stage we may offer temporary teeth to be constructed until the permanent one fabricated and back from the lab. Generally speaking, Dental Implants are very successful. Maxillary and Mandibular implants are more than 90% successful. Lower implants have a somewhat higher success rate than upper implants and that is due to the bone nature of the jaws. Occasionally, implants fail, but it is not common. Chances of an implant failure, many times, can be determined during or after the surgical phase before the replacement tooth or teeth are constructed. Smokers take note: There is a heightened risk of dental implant failure among smokers as much as a 20% greater failure rate! We will discuss with you the requirements and options for your particular situation, and If you have any questions about dental implants, please feel free to talk to us.